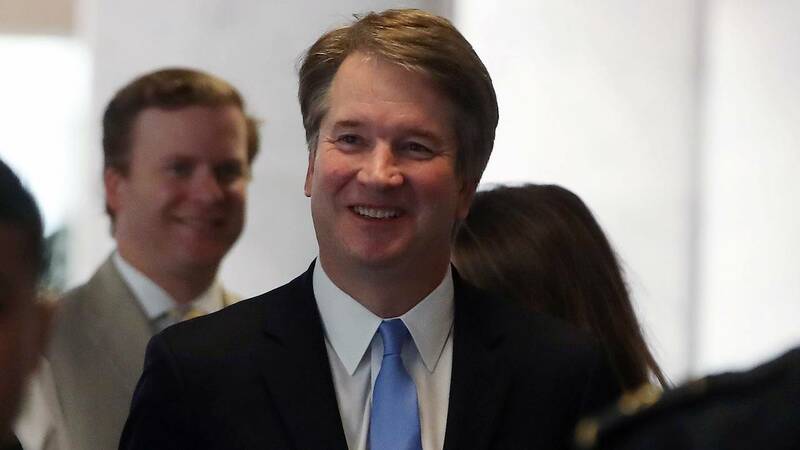 WASHINGTON (CNN) - Brett Kavanaugh, President Donald Trump's nominee to the Supreme Court, will sit down with the top Democrat in the Senate on Tuesday, according to Senate Minority Leader Chuck Schumer's office. The meeting, the first between Kavanaugh and Schumer, holds significant weight as the New York Democrat is leading the fight to produce documents related to Kavanaugh's record in government service, and as liberals seek to keep his party in lock-step against a confirmation that would dramatically shift the bent of the high court. In the latest escalation in the partisan battle, Senate Democrats last week threatened to sue the National Archives for documents related to Kavanaugh's time in the George W. Bush White House. On Thursday, Schumer said he would meet with Kavanaugh this week and ask the judge why he doesn't appeal to the archives and Bush library himself to release his full record. "I'll ask him all about these documents and about what he intends to do about it. He can't duck -- he can't duck it. It's his documents, he should say -- he should have said already he wants them released if he is an open, fair, wonderful man Supreme Court justice that he's trying to portray himself to be," Schumer said. Republicans have argued that documents related to Kavanaugh's three years as staff secretary are not relevant to his confirmation to the highest court, but Democrats say Republicans' decision to withhold the records constitutes a threat to transparency. Kavanaugh has met with dozens of senators since his nomination to fill the seat vacated by retiring Justice Anthony Kennedy was announced by Trump last month. His confirmation hearings are set to begin on September 4. Kavanaugh needs just 50 votes to win confirmation. Given the slim 51-49 majority that Republicans have in the chamber and the fact that Arizona GOP Sen. John McCain has been receiving cancer treatment in his home state, Republicans cannot afford to lose any votes and hope to advance Kavanaugh's nomination if no Democrats support him. At the same time, liberals are hoping Schumer can prevent any defection from his caucus as Kavanaugh supporters target Democratic senators who are up for re-election this year in states Trump won in 2016 as possible "yes" votes. Demand Justice, a Democratic pressure group aiming to sink Kavanaugh's nomination, rolled out a six-figure ad campaign targeting three of the red state Democrats last week. Two of vulnerable Democrats, Sens. Heidi Heitkamp of North Dakota and Joe Donnelly of Indiana, met with Kavanaugh last week. Sen. Joe Manchin of West Virginia, another Democrat up for re-election in Trump country, met with Kavanaugh last month. Heitkamp, Donnelly and Manchin broke with their leadership and voted to confirm Supreme Court Justice Neil Gorsuch, Trump's first conservative nominee to the court, last year. On Monday, Sen. Dianne Feinstein of California, the top Democrat on the Judiciary Committee, met with Kavanaugh. Exiting the closed-door sit-down, Kavanaugh declined to answer questions.